After being laid off twice from the newspaper industry, the last thing on Jeff Sirota's mind was to buy a printing business. Now, Jeff reflects on being a Minuteman Press franchise owner for 1 year and explains how and why he is thriving on this side of the print industry. I think some of my newspaper experience transferred over very well into my experience as a Minuteman Press franchise owner. The last thing on Jeff Sirota’s mind was to buy a digital print, design and marketing franchise, especially since he carried a hint of a misconceived notion that the printing industry is dying. To his credit, Jeff didn’t grab that idea out of thin air, but rather from a tumultuous experience as an executive in an entirely different segment of the print industry, the newspaper business. While he gained a treasure trove of professional experience throughout his life’s journey before becoming the successful franchise owner of Minuteman Press in Carlsbad, California, he also experienced the drain of long work hours (including weekends) only to deal with the frustrations attached to the common instability of employment in any industry: Being laid off. It happened to Jeff twice as an executive for a "Top 25" major metro newspaper. The hard work that Jeff Sirota put into his 25-year career in the newspaper industry would help him become a successful business owner. Jeff reflects, “I started my newspaper career by delivering newspapers to paperboys. Eventually, I worked my way up to Retail Sales and Operations Manager for a top 25 major metro newspaper.” The people skills he developed combined with his ability to communicate effectively at every level enabled Jeff to work his way up to a leadership position, something that would serve him well when he decided to own his own business. After all of his questions were answered, Jeff Sirota took the time to tour numerous stores, visiting and speaking with Minuteman owners. Soon after, he and his wife Olga came to the conclusion that buying a Minuteman Press franchise was right for him. The end result is that Jeff has already brought the Carlsbad location to new heights and it is performing with excellence today, producing better results now than it has in 20 years. As someone who experienced two layoffs in the newspaper industry, Jeff Sirota is the perfect example of someone who truly believed that “print is dying” and yet is now thriving as the proud owner of his Minuteman Press printing franchise. It’s a testament to Jeff’s hard work as well as the fact that contrary to what the newspaper sector might indicate, getting into this side of the printing business remains a viable option with tremendous growth potential. Jeff Sirota’s Minuteman Press franchise is located at 6353 El Camino Real, Suite H, Carlsbad, CA 92009. For more information call (760) 438-9556 or visit their website: http://www.mmpcarlsbad.com. Learn more about Minuteman Press printing franchise opportunities at http://www.minutemanpressfranchise.com. 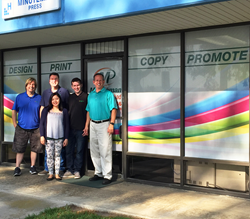 Minuteman Press, Carlsbad, CA - left to right: Graphic Design Mgr Ron Jones, Prod. Mgr Bill Hawk, Customer Service Mgr Karina Revita, Prod. Specialist Shane Sirota, and Franchise Owner Jeff Sirota Extra! Extra! 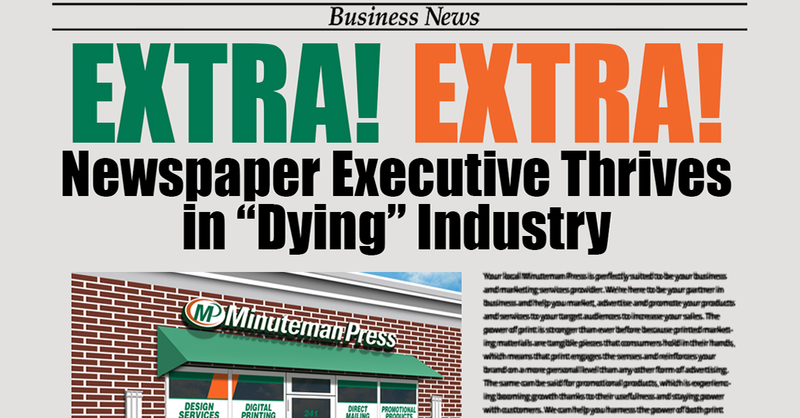 Newspaper Executive Thrives in “Dying” Industry Minuteman Press franchise locations offer a wide range of creative design, digital printing and marketing services to businesses and clients.